These last few weeks have been a whirlwind of fun for me. I traveled to New York City to see my dearest friend/watch the pretty people pass by during Fashion Week and had some trouble getting back down South due to Irma. I’m super grateful for the sights, friends and food I experienced there and cannot wait to return! Upon arriving back in Birmingham, it was 60 degrees and I could not deal with that. Who said it was Autumn?But it’s back to the sweltering September temps of old and I’ve got fashion on the brain. I didn’t watch the actual Emmys but I’ve watched countless red carpet slideshows so I was basically there. I won’t be commenting on looks that I didn’t love- I’ll leave that for the Fashion Police. I’ll just focus on the gowns and glam that truly spoke to me! Here we go. Reese is giving me newly divorced trophy- wife cobalt realness. The middle part and suitdress are Kim K while the fresh face paired with a bold lip are classic Hollywood glamour. I love that she lived on the edge this night- a total departure from some of the sweet, demure gowns we’ve seen on Ms. Witherspoon in the past. Everyone who can/ could pull off a white wide-leg pantsuit in September raise your hand! *squints*. Evan Rachel Wood, in all her ethereal glory, gave us a lesson in personal style this past Sunday with this beautifully detailed Moschino look. She looks like a mischievous angel who landed on Rodeo Drive just before closing time. Loving the clutch as well. Controversial pick! 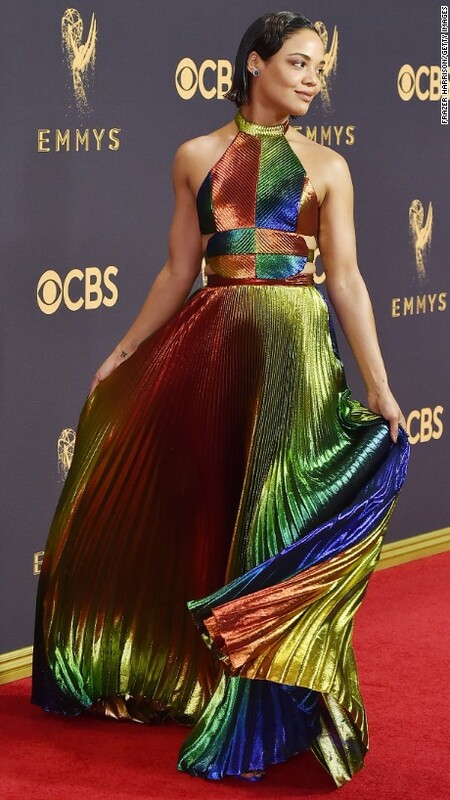 I was given every flavor in the rainbow by Tessa Thompson in this Rosie Assoulin gown. J’adore le flow, the energy and the minimalism of the makeup to keep the look balanced. This is Lisa Frank in hue with a very grownup silhouette and I’m on board. Live your best, colorful life Tess. Rashida Jones gets 2 pictures because I loved it the most! Living for the whisper of wisteria color, the triangular cut-out, and fun texture below the hips. A sleek bang and neck-grazing earrings complete the perfection. And then she wore glasses onstage?! Could not swoon harder. Thanks for reading. We’ll chat soon. Posted in About Me, Uncategorized and tagged Emmys, fashion, NYC, travel, women, yas. Bookmark the permalink. Did we not see Nicole Kidman….. the tea length, the red, the jewels. And also no Zoe ; YOU DONE GONE CRAZY. Just my opinion though 👍🏿Blessing you with it!